Peering through these brick ruins, one can see all that remains of the once-renowned Chick Springs Hotel. 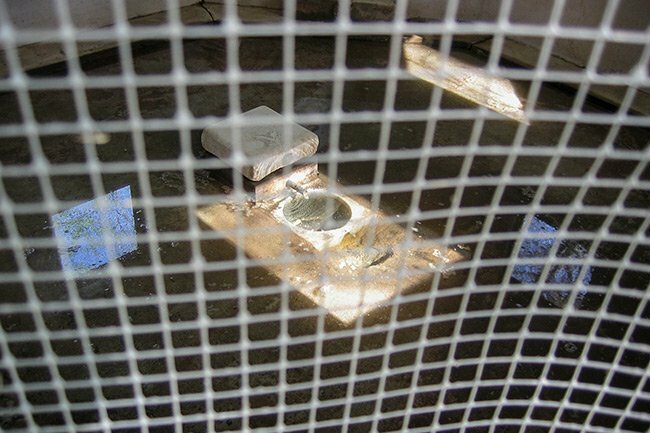 The spring house and gazebo rest on property in Taylors where a mineral spring still bubbles and was at one point thought to have healing properties. The Native Americans who lived along the Enoree River used the waters for years before the spring was discovered by white settlers. Even renowned architect Robert Mills is said to have traveled to the spring to take advantage of its medicinal qualities. 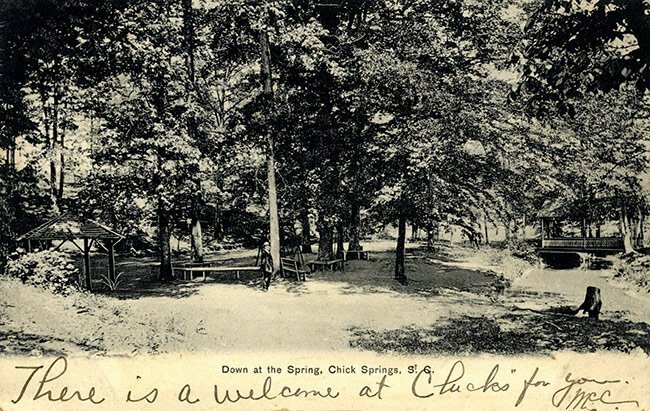 In the 1830s Dr. Burwell Chick hunted on land here, guided by Native Americans who introduced Chick to the healing mineral waters found on the land they called Lick Spring, as it attracted deer who licked the local rocks. 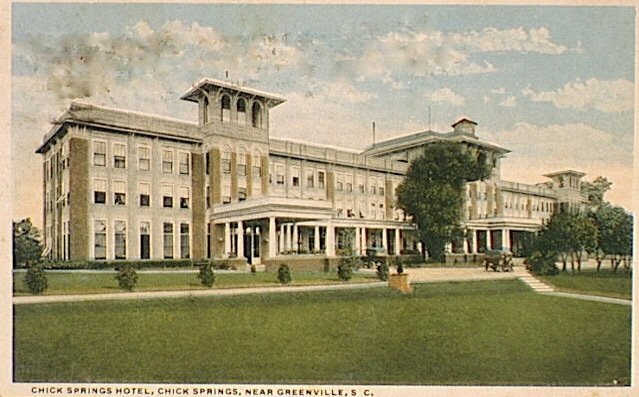 By 1840 Chick had opened a hotel on property near the spring and called it the Chick Springs Hotel. 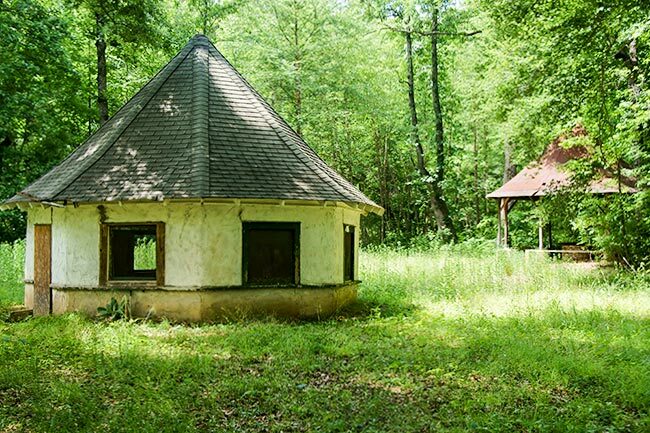 Similar to Glenn Springs in neighboring Spartanburg County, people traveled here from far and wide, both for leisure and in hopes that the springs would cure whatever ailments they suffered. Chick’s sons, Pettus and Reuben, continued operating the hotel following his death in 1847. A decade later, the resort was purchased by Franklin Talbird and John T. Henry, and the hotel continued to prosper. However, business slowed with the start of the Civil War, and in 1862 the hotel burned. The Chicks bought the property back in 1868, though they sold it to George Westmoreland in 1885, who briefly revitalized the once-popular retreat. By 1903 the property was sold to J.A. Bull, and the Chick Springs Company was established to sell the mineral water in bottles. Bull also enlarged the hotel and added several amenities to attract guests. Another fire struck the resort in 1907, and Bull managed to rebuild a larger hotel by 1914. However, the new hotel failed, and the property was used as a military academy from 1916 through 1917. In 1927 the Chick Springs Ginger Ale Company formed to sell soft drinks made from the mineral water. Also during this era a large swimming lake was constructed on the grounds, which has since been filled. The ginger ale company went out of business during the Great Depression and much of the property was sold at auction, leaving few reminders of those days when the resort entertained guests here by the hundreds. In 1937 the land on which the spring sits was again deeded to J.A. Bull, who bought back more of the surrounding acreage in 1939. However, the hotel property was purchased in 1937 by car dealer R. E. Foil, who sold it to Dr. J. E. Brunson in 1941. By this time the hotel had been demolished for scrap, and Brunson built a house on the hotel’s foundation. 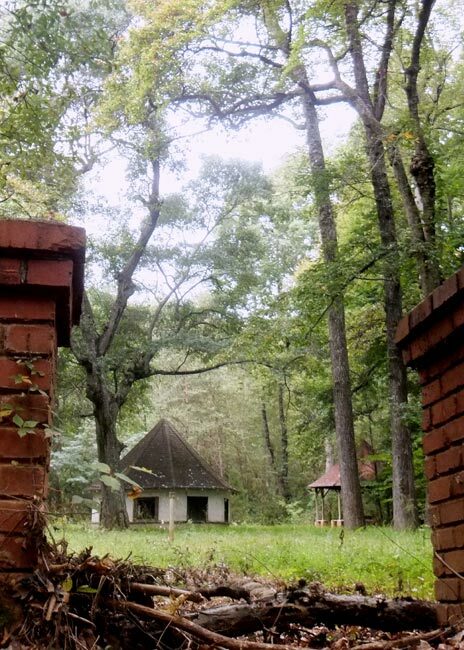 The Chick Springs Historical Society was organized in 2008 to try to preserve the spring house, gazebo, and surrounding land in the form of a public park, still owned by the Bull family. However, the park has yet to be built, and the land remains overgrown. Thanks for the wonderful history lesson, I did not know any of this before. I lived in the area in the fifties and enjoyed the swimmin’ hole every week when the weather was nice. My uncle Bill Murph taught me how to swim there and oh the slide! We always had a wonderful time, but the history, I had no idea. Thanks! William Hannah Ray was my fourth great grandfather, he was the original grantee of the 692 acres of land on which Chick Springs (as it was later known) occurs. I am interested in any contact available to assist me in finding out who Hannah’s father was, his wife was Elizabeth Boden or Bowden. I very much enjoyed the information documented here in this text and the photos herein. I would also like to know if there is access available to to get a copy of the history of Taylors, which also speaks of Hannah and his grant of the 692 acres. Thank you so much for the kind words! This is the larger hotel built in 1914. This is a wonderfully concise write-up on this site. Would love to know which version of the resort is depicted in the postcard. Thanks. Wonderful article, very detailed and informative, thank you for sharing. Would you know if this property is posted? Can one hike to this area for research? Fascinating bit of history. Can’t help but wonder why the hotel would burn twice. Perfect setting for fiction and nonfiction literature. We recommend contacting someone with Taylors. Good luck! who is the contact person to explore this property?